Sheesh. I went and read this and now my bloglines are up to like 867 New Items. This happens to me every year -- I'm not sure what it will take for me to learn the lesson. Do not follow every link these girls lay before me! 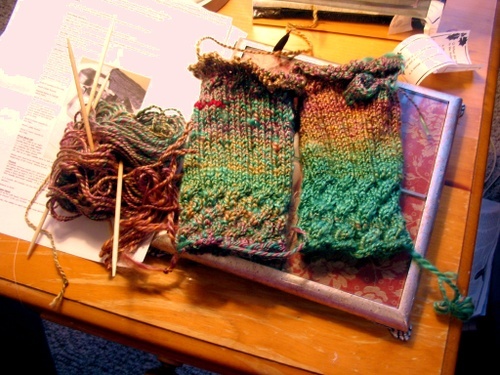 Yesterday's knitting was limited to nearly completing a pair of fetching mitts out of my hand spun. Dance Mistress tencel blend to be more specific. And I learned a lesson. The gauge of the item one knits from the beginning of the skein of hand spun yarn can vary widely from the gauge of the item one knits from the middle of the skein of hand spun yarn. Case in point. You be the judge. You might say, "But you must have knit a different number of rounds between cabling!" To which I'd say, "Nope." And the stitch gauge isn't even that different. It's row gauge. Spun tighter, maybe? Plied tighter? Does that influence row gauge and not stitch gauge? It's a mystery to me. Speaking of tomorrow. It's January 6th... Epiphany ... you know, the beginning of Carnival Season. Which culminates in Fat Tuesday. Which is followed by Ash Wednesday. Which means another season of Lent. Which means 40 Days For Others. I think I'll start a blog for it this year. Anyone have any charity knitting they want to accomplish? I already have two sweaters, a scarf, and two hats to throw in the ring. This year I'll knit for the St. Vincent de Paul Church homeless outreach. They like real wool for their contributions. Dennis tells me that wool is warmer, and his recipients don't tend to wash, or even keep their stuff year to year. "They don't have cabinets to keep it in, you know, " he said. Um, he's right. So. Wool it will be. Hats mostly is what he needs. But he'll take any knits. They have lots of men, but can distribute items to families as well. They also take bedrolls -- quilted and knit. So we can piece knit or sewn squares for bedrolls too. I'm contemplating asking for squares... give me some time to figure that out, k? Anyone else want to knit for charity this winter?